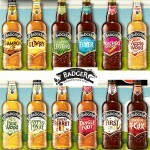 BADGER ENGLISH ALES & CIDERS NOW AVAILABLE! Now available at On Tap – Badger Traditional English Ales & Ciders. 8 different ales at 199NT each, and 2 ciders at 230NT (all 500ml). Choose your Badger!